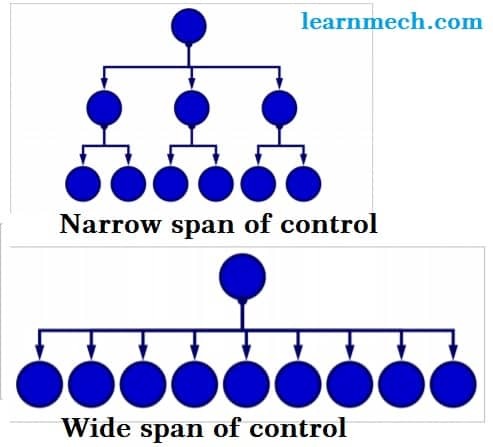 Span of Control means the number of subordinates that can be managed efficiently and effectively by a superior in an organization. It suggests how the relations are designed between a superior and a subordinate in an organization. Different ability and capacity of leadership, communication affect management of subordinates. Efficient and trained subordinates affects the degree of span of management. Different types of work require different patterns of management. Degree of centralization or decentralization affects the span of management by affecting the degree of involvement of the superior in decision making. Plans which can provide rules, procedures in doing the work higher would be the degree of span of management. Pattern of communication, its means, and media affect the time requirement in managing subordinates and consequently span of management. Use of Staff assistance in reducing the work load of managers enables them to manage more number of subordinates. If subordinate receives supervision form several other personnel besides his direct supervisor. In such a case, the work load of direct superior is reduced and he can supervise more number of persons. Narrow Span of control means a single manager or supervisor oversees few subordinates. This gives rise to a tall organizational structure. Wide span of control means a single manager or supervisor oversees a large number of subordinates. This gives rise to a flat organizational structure.